"Were they the first white people to see the Blowering Valley?" By the 1820's various explorers had extended the boundaries of the Colony of New South Wales but the nature of the interior of south-eastern Australia was unknown. Governor Brisbane wanted an expedition mounted to investigate the quality of the land between Lake George and Westernport on the southern coast of the continent. 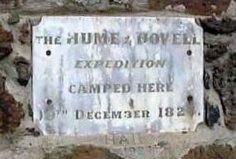 Hamilton Hume was recommended to him as a competent and experienced bushman and explorer. He was joined by William Hovell an Englishman who had been a ship's captain. The journey commenced on 3rd October 1824. The party comprised Hume and Hovell and six assigned men seeking tickets of leave. In order to reach Westernport, the explorers endeavoured to follow a south-westerly routes on every possible occasion, travelling along the western edge of the Great Dividing Range and over the plains toward what would become Albury. After ingeniously crossing the Murray River by building a raft using a tarpaulin, they continued on, reaching Port Phillip on 16th December 1824, at the present site of Geelong. The poor state of their provisions forced them to set out on the return journey almost immediately. They arrived at Hume's outstation near Lake George on 18th January 1825, completing one of the Colony's most significant explorations. They had travelled more than 1900 kilometres on foot, in only 16 weeks, and in doing so had discovered some of the most fertile land on the continent. To The Late HAMILTON HUME, EXPLORER.